Tag Archive | "border dispute"
The Atacama Corridor: Spoil of War or Illegal Occupation? On September 24, 2015, the International Court of Justice, or ICJ, overruled Chile’s preliminary objection to the court’s jurisdiction to hear a case filed by Bolivia against them two years prior, known as the Obligation to Negotiate Access to the Pacific Ocean (Bolivia v. Chile). As the title of the case suggests, Bolivia is requesting that the ICJ declare that Chile has an obligation to negotiate an agreement that would allow Bolivia access to the sea. Bolivia, as a landlocked country, has sought out a sea port since they lost all of their coastal territory to Chile in 1884 after the War of the Pacific. To this very day, the ceded territory has been a source of bitter controversy between the two countries, and has yielded myriad unsuccessful requests for the two countries to come to a compromise on the issue. That has been the case until April 24, 2013, when the president of Bolivia Evo Morales took the issue to litigation in the ICJ. Chile has generally been unwilling to allow any sort of Bolivian corridor to the Pacific, and while that may not seem very fair, Chile’s obstinacy has more merit than one would ostensibly observe. The War of the Pacific was a war founded on complex strings of business assets, alliances, and economic crises that would require a college thesis to explain fully. But in summary, Chile had occupied Antofagasta, a town within Bolivian territory at the time, in an effort to protect a large and powerful Chilean company’s business assets from the Bolivian government’s decision to confiscate them. This occupation was seen as an act of war by the Bolivian government, and despite a cursory attempt to find a diplomatic solution, Bolivia invoked a secret treaty between Peru and themselves. Together they declared war on Chile for the occupation. Dragged into the conflict, Chile had been extremely successful in the war, and by 1883, was able to defeat both countries and force an armistice. Chile signed two separate peace treaties with Peru and Bolivia, the Treaty of Ancón and the Treaty of Valparaiso, respectively. 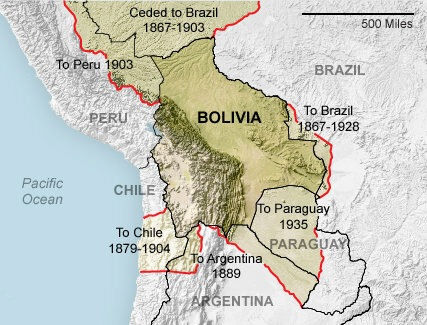 The Treaty of Valparaiso, with the proceeding Treaty of Friendship in 1904 to make the arrangement permanent, relinquished all of Bolivia’s coastal territory to Chile; and in exchange, Chile promised to construct a railway between the capital of Bolivia, La Paz, and Arica, a coastal town now within the confines of Chilean territory. Chile also promised to allow all Bolivian commerce to move freely between the two towns. Essentially, Chile would be guaranteed a corridor to the sea that would be unobstructed by Chilean duties or regulation. To this day, the contested land has been known as the Atacama corridor. Chile has made good on its promise to allow unrestricted access to the sea for Bolivian commerce, but Bolivia has increasingly sought sovereign control of the Atacama corridor instead. Chile does not feel it has any obligation to grant Bolivia accommodations beyond what was agreed in the 1904 Treaty of Friendship, while Bolivia claims that the Chilean government has made diplomatic promises to them in the 1950’s and 1970’s regarding a sovereign route for Bolivia, and seeks to essentially bind them to fulfilling that promise through the ICJ. This is where the case is today. The ICJ has held that it does have jurisdiction to hear the dispute, despite Chile’s proposition that the Court lacked jurisdiction due to Article VI of the Bogota Pact preventing the ICJ from deciding matters, “settled by arrangement between the parties, or by arbitral award or by decision of an international court” or “governed by agreements or treaties in force on the date of the conclusion of the [Pact of Bogotá].” The ICJ did not feel the Treaty of Friendship settled this particular matter, and believed it said nothing of a potential agreement to grant Bolivia sovereign control over that corridor. Therefore, the Court felt that jurisdiction was proper and continued with the case. What the ICJ will decide on the matter is difficult to ascertain. 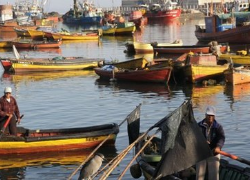 Many experts believe that Bolivia is fighting a losing battle, while others believe that Bolivia’s sovereign right to the sea is overdue for recognition. The ICJ has never recognized a “right of expectation” that Bolivia is putting forward, and may not even be likely to do so now. Regardless of the outcome, this case literally could wind up changing our maps as we know them, and it will be fascinating to observe as the case moves forward. About a month ago, the International Court of Justice at the Hague (“ICJ”) issued a ruling in a dispute between Peru and Chile that was instigated in 2008. Over 14,000 square miles of ocean in international waters were at stake. The ruling granted Peru control over the majority of the disputed waters, but Chile retained some of the most fertile fishing waters. Peru and Chile are the world’s largest exporters of fish, making it a primary economic resource for both countries. Peruvians consider the ICJ ruling an opportunity to gain national pride and redemption after being defeated in the War of the Pacific over a century ago. While Peru filed the action in 2008, this dispute reaches back to the 19th century. The War of the Pacific centered on a conflict over the nitrate industry, which resulted in a Chilean victory over both Peru and Bolivia. This gave Chile the power to annex coastal provinces. The War of the Pacific created uncertainty regarding coastal boundaries that continued into the 20th Century. A maritime boundary was partially created in 1952 upon the signing of the Santiago Declaration. The Declaration’s purpose was to establish sovereignty and exclusive jurisdiction over the waters that are adjacent to Peru, Chile, and Ecuador. The initial concern involved problems with whaling fleets that threatened the resources in the area. However, some 30 years later, Peru took the position that the maritime territory was not adequately defined. In 1986, four years after the U.N. Convention on the Law of the Sea went into effect, Peru visited Chile with the intent of re-negotiating the water territories. Chile was uncooperative and was not amenable to negotiation, which led to this suit in the ICJ. Peru asked the ICJ to define the maritime border between Peru and Chile based on the criteria of equidistance in the contested area. Chile contended that the border should extend parallel to the equator. Because of these disagreements, Peru wanted the ICJ to legally define both countries’ maritime territory. The ICJ’s ruling, which cannot be appealed, struck a balance between the two countries’ arguments by announcing that a parallel border already existed that extended 80 nautical miles to the equator, and then the ICJ “drew a line southwest to where the countries’ 200-mile territorial waters end.” While the ICJ largely agreed with Peru’s position, Chile retained much of the fishing territory. Chile is still concerned, however, about the effect the decision will have on its fishing industry. Peru’s victory is primarily a “symbolic one: for the first time it has won a battle with Chile, and it has done so by peaceful, legal means and through professional diplomacy.” Because Chile retains much of the fruitful waters, there is promise that relations between the two countries will improve. However, Peru remains apprehensive with regard to whether Chile will enforce the ruling adequately and still expects protesting from Chilean citizens. While some Chilean fishermen have protested in a northern port, protests have not been overwhelming so far and local authorities have been able to control the aftermath. 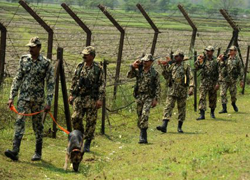 Last week the prime ministers of India and Bangladesh signed a watershed agreement resulting in a dramatic change to the messy border created during the fall of the British Empire in the 1940s. The agreement will exchange 201 plots of land or “enclaves,” which are pockets of Indian communities surrounded by Bangladesh, and vice versa. The long-overdue agreement will help to address the abject poverty faced by those living within the enclaves, as well as the border, trade and transit disputes that rifle the region. Sanjoy Hazarika, an analyst with the Center for North East Studies and Policy Research in New Delhi believes the Bangladeshi Prime Minister, Sheik Hasina Wajed, is responsible for many of the improvements between Indian and Bangladeshi relations. After the Prime Minister turned over suspects wanted by India shortly after her election in 2008, Mr. Hazarika argues that “India has bent over backward to try and improve relations involving water and trade” with Bangladesh. The border disputes have led to a lack of law, as well as a deficiency in meeting the basic needs of enclave residents, including electricity, access to healthcare and employment opportunities. Because “a lot will depend on how it’s played out locally,” Mr. Hazarika argues that the growth of local markets at the grass-roots level is a vital addition to the political deal. Additionally, the territorial exchanges should address issues of citizenship that have existed since the conception of the enclave arrangement. Wilhelm Schendel notes in his book “Stateless in South Asia: The making of the India Bangladesh Enclaves” that essentially no thought was given to the residents of enclaves “when what was then East Pakistan and India agreed to impose passport and visa controls for the first time . . .” By not taking into consideration their own citizens living in the “pocket territories” surrounded by the foreign state, the policy, in effect, created areas of “statelessness.” Residents could not acquire passports within their respective enclaves, thus forcing them to illegally cross foreign territory to reach their parent state in an attempt to attain a passport. They would then have to travel the hundreds of miles to the consulate of the foreign state in order to acquire a visa to return home legally. The new agreement should address the citizens who essentially were abandoned in the passport and visa arrangements. Although the agreed exchange of land boundaries will help to ease border issues and hopefully improve the lives of the individuals living within the regions, it is indisputable that India will suffer a net loss of 40-square-kilometres through the agreement. In addition to protests from the AASU and AGP, India’s political opposition, Bharative Janata Party, is utilizing the opportunity to attack the ruling Congress Party as a soft and weak government. Only time will tell how the agreement will play out in the political realm, given the declining support for each government back home.